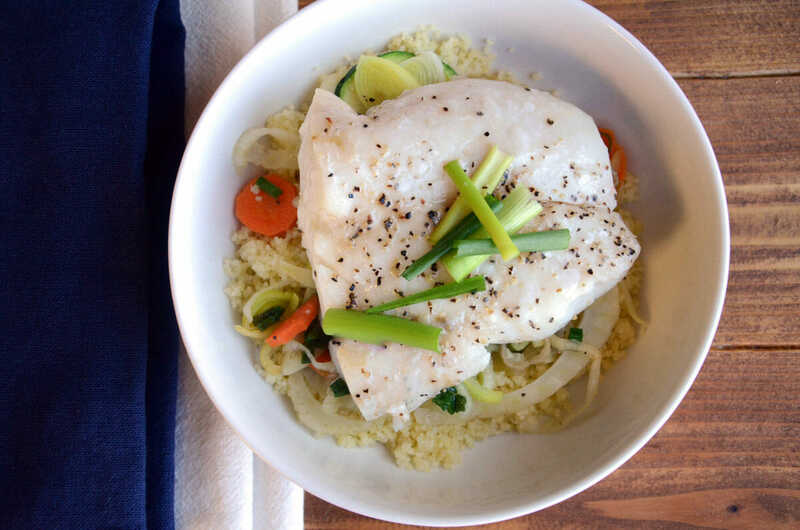 If you are looking for a light, one dish meal, that has all of your protein and veggies, try this fresh and delicious steamed sole dish. If you’re not a fan of sole (dover or lemon) use any of your favorite light white fish. The fancy way to cook this dish is en papiotte, where you bundle each portion inside of parchment paper and seal them and each person gets their own little package, cut open and steaming hot. I have simplified this, and bake it all on a sheet tray or pyrex, covered tightly, and served family style. Make sure to cut you veggies super thin, so that the fish and the veggies cook in the same amount of time. Serve on a bed of cous cous to sop up the delicious juices. Place all of the vegetables, zest and herbs on the bottom of a sheet pan, lined with foil, or a Pyrex dish. Add the olive oil, salt and pepper and mix. Top with the fish, seasoned with salt and pepper. Add the wine, making sure not to wash off the seasoning, and cover with parchment paper and then with heavy duty foil – tightly sealed. Place in the oven and cook for 20-25 minutes, depending on the thickness of your fish. Remove from oven and let sit for a few minutes before uncovering and serving. Serve over a bed of cous cous to catch all of the juices.